"I can't thank you enough for the library urn!! I searched online for days for something different and was so excited to find this! Your customer service was excellent and the product packaging/instructions was very professional and user friendly. 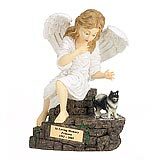 Thank you for catering to pet lovers everywhere with such great & unique products!" 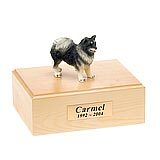 All available Keeshond dog urns and memorials will be displayed with the figurine on the Keeshond urn you select and in the appropriate size.